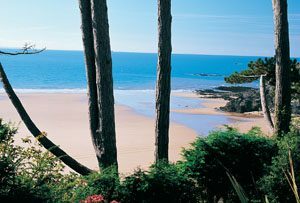 Our self catering cottages are perfect for exploring the famous beaches of South Wales. The many safe sandy beaches on the Gower Peninsula are between 15 and 30 miles from our holiday cottages, whilst the Pembrokehsire coast is less than an hour away. Unlike many other destinations, our unique location at the centre of South Wales makes it easy to visit the Gower beaches, Pembrokeshire beaches and Glamorgan Heritage Coast beaches – all in one holiday! Our guests love to spend days on family friendly beaches like Rhossili, Three Cliffs or Tenby, before retreating to the peace and tranquility of their countryside cottage at Plas Farm. world famous coastline on the doorstep…In 2011, National Geographic magazine named South Wales as the second best coastal destination in the world. 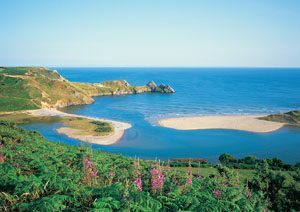 More recently, Lonely Planet named the coast of Wales number 1 in its Best in Travel: top 10 regions for 2012. There are five Blue Flag beaches on the Gower, including Rhossili Bay and Port Eynon, both of which have won the title of “Best Beach in Britain” in recent years and both of which are within easy reach of our holiday cottages. If you don’t want to visit the beach, but would still like to see the sea during your stay in Wales, a ten minute stroll up the hill behind the holiday cottages will bring views of Swansea Bay and the Bristol Channel (including the north Devon coastline). Rhossili Bay is a 3 mile expanse of golden sands and a perfect beach for relaxing on, walking across or if youre looking for something more active, the Atlantic swells make this a perfect area for surfing. Boards and wetsuits can be hired from the surf shop near Worm’s Head and beginners can also get lessons here. All of the Gower beaches are within 15 to 30 miles of our cottages but you should certainly plan to spend a whole day on Gower. Other beaches in the area such as Tor Bay and Three Cliffs Bay are worth it for the clifftop views alone and there are plenty of others to chose from – all with their own character. Some are good for swimming, some good for surfing , some good for walking – there is something for everyone. It is also worth noting that many of the Gower beaches are dog-friendly, as are some of our holiday cottages. 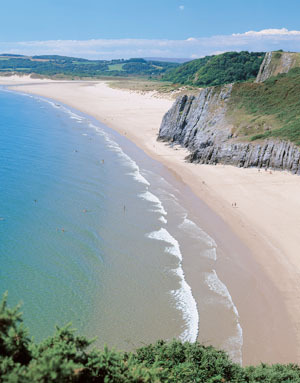 Read more about the Gower beaches. 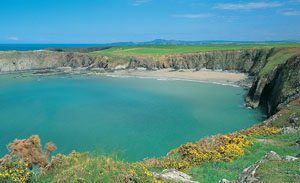 Another favourite day trip for our guests is a visit to Pembrokeshire Coast National Park, Britain’s only Coastal National Park. The region is famed for its clear blue waters, limestone and sandstone cliffs, and some of the least crowded beaches in the UK. The park starts around 50 miles away in Amroth near Tenby. A walk around the town of Tenby is always a pleasure, and from here you can take a trip out by boat to Caldey Island, famous for the monastery where the resident monks make perfumes and chocolate- nice gifts to take back home with you. Both Gower and Pembroke coasts are wildlife hotspots. Seal sightings are common and lucky visitors sometimes spot dolphins and whales from the coastal paths. If you come to South Wales for a summer holiday, don’t miss the puffins on Skomer Island in Pembrokeshire! 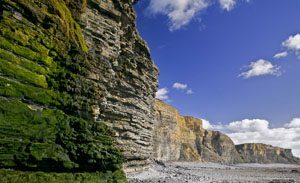 Other areas of interest include the fossil-rich coastline around Nash Point and Llantwit Major (35 miles away), and the excellent surfing to be had at Rest Bay (25 miles away). Again, board hire and lessons are easy to find. You can even try kite surfing in on the beach if you’re feeling really adventurous. If not, the family entertainment of Coney Beach fun fair is just around the corner. In Summer, Coney is also home to donkey rides for kids and some of the best ice-cream in South Wales.